And the Purple releases keep on coming... as it happens though, this one offers something radically different from a lot of the others. 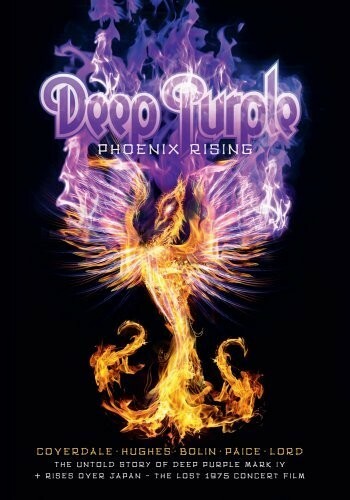 'Phoenix Rising' is a DVD set dedicated purely to Deep Purple Mk IV - the ill fated Coverdale/Hughes/Lord/Paice and Tommy Bolin era. Recently Deep Purple's 'Come Taste The Band' album has had a bit of a resurgence. I've liked it for years and years, but I wasn't born when it came out, so I wasn't affected by the 'hey, this guy isn't Blackmore!' syndrome that happened to a lot of fans. That's perfectly understandable - Ritchie Blackmore was a staggeringly talented and influential part of Deep Purple and the band has never really been the same without him. However, what I can say is, as far as I'm concerned they made two fantastic albums without him - one is 'Purpendicular' and the other is 'Come Taste The Band'. You could argue that they aren't really Purple albums, but you'd be hard pressed to argue they aren't any good. 'Phoenix Rising' offers about as definitive a look as you could possibly get at Mk IV Purple. The DVD contains a 30 minute section of concert footage of the band live in Japan. Frankly, it's not pretty - Glenn Hughes shrieks his way through many parts, Coverdale sounds gruff and looks a bit portly. Jon Lord does his best to hold it all down, Ian Paice - well, he's just absolutely phenomenal. Tommy isn't at his finest here, but it does give you a very rare opportunity to watch him live with Purple. The real selling point though, is the 80 minute documentary that accompanies this show. Featuring brand new interviews with Glenn Hughes and Jon Lord, the two talk you through everything from Glenn being approached to join the band, to asking Paul Rodgers to join, to him saying no and them then the group hearing Coverdale's audition tape, to Blackmore's departure and Tommy's arrival. This is spliced in with archive footage and vintage interviews, including bits from the California Jam, performances from the 'Burn' tour, and rare clips of Ian Paice and Tommy Bolin talking. Both Lord and Hughes are very frank with their opinions, with Lord offering his views on 'Burn', 'Stormbringer', 'Come Taste The Band' and the talents of Hughes and Coverdale, and Glenn explaining in no uncertain terms how much he was ravaged by cocaine addiction. There is also a terrifying account of a trip to Jakarta, along with a full description of how everything came crashing down in Liverpool in 1976. If that wasn't enough, the DVD is accompanied by a CD, featuring some of the Japanese tracks and some tracks from Mk IV's performance at Long Beach - a gig that many believe is the finest surviving recording of the band (it was previously released in full as 'On The Wings Of A Russian Foxbat'). The audio has been re-mastered and sounds fantastic - some of the vocals are still dodgy, but the band sounds pretty hot. You can get the set either in a double disk jewel case, or a deluxe DVD digipack, which has a replica magazine packed with press clippings and photos from the time, and interviews with the band. It's all wrapped up in gorgeous artwork and offers easily the best look at the Bolin period to date.